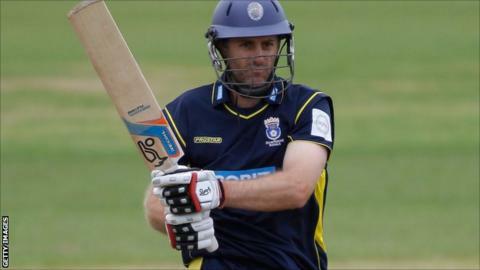 Hampshire's overseas batsman Simon Katich has returned to his native Australia and has admitted he does not know if he will be back next season. The 37-year-old has retired from first-class cricket in Australia and has discussed a return to England in 2013 but needs time to make up his mind. "I would love to say 'yes I am going to be involved because I have loved the success and it would be nice to have more'," Katich told BBC Radio Solent. "I wish I knew what I was going to do." Katich, who has played 254 first-class matches in his career and scored 19,829 runs and 54 hundreds, added: "Once the dust settles hopefully I'll be able to make a decision in the next few weeks." The Australian, who won both the FL t20 and CB40 competitions with Hampshire this season, says family commitments may prevent him from returning. But he admits the amazing success the county have enjoyed this year makes it very tempting to return. "This uncertainty has been ongoing for quite a while," he said. "I decided not to play back in Australia and in my mind it has created an an uncertainty. "I'm not sure what my next move is going to be. I have an idea what I am going to do, it's just when I'm going to do it. "The success here has made the decision hard as I've really enjoyed it and I want more of it, but at 37 I've got to be realistic. "When I was younger it was easier because you are always playing but because I have retired at home I have had to start looking to the future. "With a young family that's also added a different dimension as well."